If you’re new to formative assessment probes, you’ll love the latest book in the bestselling Uncovering Student Ideas in Science series. 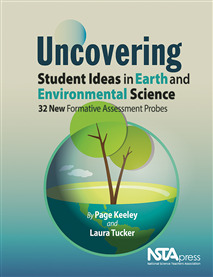 Authors Page Keeley and Laura Tucker give you 32 engaging questions, or probes, that can reveal what your students already know—or think they know—about core Earth and environmental science concepts. Armed with those insights, you can use the probes’ teacher notes to adjust your approach and present the science in grade-appropriate ways so students will learn the content accurately. This book would be a great resource for a variety of teachers who include earth and environmental science in their instruction.